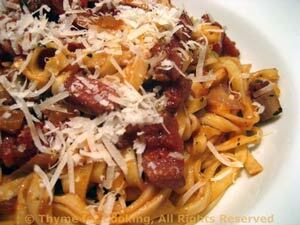 Easy Dinner: Pasta Amatriciana, Weekly Menu Plan. I used a package of fresh linguine for this, and with the light sauce, it wasn't too much. If you like hot, add the red pepper flakes or Tabasco. Mon mari adds it at the table, out of consideration for my wimpy palate. This is a classic Italian dish, with probably as many variations as there are Italian cooks. Mine comes from a combination of cook books blended with what I like. Make it as hot as you like. Drain tomatoes, reserving juice, and roughly chop. In medium skillet sauté bacon until just starting to crisp. Remove and set aside. Drain all but 1 tbs fat from pan. Add onion, garlic and sauté until tender. Add chopped tomatoes with their juices, wine and herbs. Tear bacon into chunks and add to skillet. To finish: Drain pasta and toss with Parmesan, then sauce and serve with more Parmesan on the side.